Bollard covers require no maintenance. Bollard sleeves pay for them self in no time. Ribbed for added protection. Bollard covers easily slide over you existing posts so they will look good for many years. They eliminate the need to ever have to repaint again. Generally they pay for themselves with one repainting of your existing posts when you consider the cost of the paint and labor. No more scraping. Bollard sleeves can be used indoors or outdoors. Besides eliminating annual maintenance, they help protect vehicles and the post from impact damage. These ribbed bollard covers are made of high density polyethylene with UV inhibitors to resist fading, rusting or cracking. Installing bollard covers and bollard sleeves is a breeze. They easily slide on, available for 4", 6" and 8" NPT pipe sizes and can be trimmed to fit exactly. 56" long in all colors and 72" length in yellow 6" and 8" posts. Available in nine colors. Our most popular colors - yellow, red, blue and white can be ordered online below. To order orange, lime, brown, green or black bollard sleeves contact us at (800)869-9633. 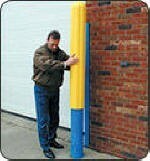 We also carry smooth post sleeves and decorative bollards. Order bollard covers and bollard sleeves online below. Ribbed to provide extra impact protection. Made of tough high density polyethylene. 56" height all colors, 72" length in yellow 6" and 8". 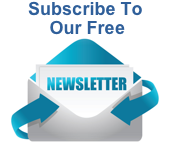 Easily improve the looks of your property. When you consider the cost to scrap and paint your posts, the cost to purchase bollard covers is zero over time.